The Z994R offers enhanced comfort, increased productivity, lower operating costs and longer engine life. Powered by a three-cylinder, liquid-cooled Final Tier 4 diesel engine, the high-torque, low-emission engine provides power with low vibration and noise levels. A single 11.5-U.S. gal. 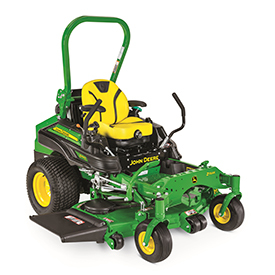 diesel fuel tank with an easy-to-read fuel gauge offers increased productivity. Three seat options with adjustable armrests and the ComfortGlide™ fore/aft suspension enhance comfort and ride quality. Available with three deck options – 54-in. and 60-in. side-discharge decks, and 60-in. Mulch On Demand™ deck, the Z994R is also compatible with the MICHELIN® TWEEL® X® Turf airless radial tires.